The building blocks of life on Earth may have originated in space. Chemists at the University of California, Berkeley and the University of Hawaii, Manoa have found the complex compounds essential for life can be forged in the vacuum of space. 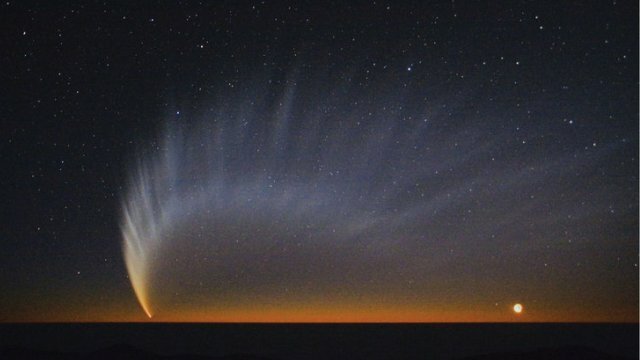 The linked pairs of amino acids, called dipeptides, may have hitched a ride to Earth on comets and meteorites. The question has fascinated people on Earth for centuries, Mathies says. Scientists have long believed amino acids formed in the planet’s early oceans (think Primordial Soup). A 1952 experiment proved this. In what’s known as the Miller-Urey experiment, scientists put water, ammonia, methane and hydrogen in a series of glass tubes, electrocuted the mix (to simulate lightning) and watched it turn pink overnight as it all combined to form amino acids. Scientists have also found amino acids on meteorites that have collided with Earth, but not the more complex compounds required for this planet’s biology, so they have defaulted on the assumption that these biological precursors formed in the ocean. But Mathies’s study, scheduled for publication March 10 in The Astrophysical Journal, turns this assumption on its head. While scientists know early Earth got its water and some hydrocarbons from comets, it hasn’t been clear until now what catalyzed the creation of more complex compounds. Mathies’s experiment suggests cosmic rays are the answer. In Hawaii, Seol Kim and Ralf Kaiser simulated a comet, an icy snowball in space, by chilling a small silver “puck” in an ultra-high vacuum chamber. These pucks, about 10 mm in diameter by a few millimeters thick, were covered with a molecule-thin layer of carbon dioxide, ammonia, methane, ethane and propane. Then the researchers nuked the mixture with simulated cosmic rays, in this case high-energy electrons. Kaiser FedExed the pucks back to Berkeley, where Mathies and Amanda Stockton analyzed them in a machine called the Mars Organic Analyzer which Mathies built to detect small organic molecules in our solar system. He found nine different amino acids and at least two dipeptides, the precursor compounds for proteins, enzymes and sugars, all of which make Earth biology possible. The results suggest that means cosmic rays were irradiating comets for much longer than the billion or so years life on Earth has existed, Mathies said. It’s possible, he said, that this happened on other planets, too. The next step is to actually find these dipeptides in space, since comets that have landed on Earth would be immediately contaminated. Mathies said the suitcase-sized Mars Organic Analyzer can be launched into space on a rocket to pass through a comet tail and collect dust. “That would be the ultimate proof,” he said. Sean Greene was an intern for KQED Science. He is a proud alumnus of UCLA (2011) and the Daily Bruin and is now a student at the UC Berkeley Graduate School of Journalism. Before moving to the Bay Area, he freelanced for the Ventura County Star and The Orange County Register. Each story is an adventure, and the best ones are those that get him outside and exploring new places.